Schurter FMAC NEO 3-Phase Mains Filter | UK Electrical Distributors – E. Preston (Electrical) Ltd.
Schurter launches its single-stage filter family FMAC NEO. Especially compact with high performance, the new filter series is ideally suited for use in today’s more portable industrial machines, designed to occupy less floor space in manufacturing plants. A wide temperature range extends its capabilities for use in many critical applications. Three-phase control cabinets, in particular, can have space constraints. SCHURTER addresses this problem with a completely new filter design, which is much more compact than older generations. The new, almost cubed, design makes optimum use of available space in the cabinet housing. Designed with the highest quality components, the filter attenuation remains very high relative to its more compact dimensions. The new filter family is also suitable for use in devices subjected to high EMC loads such as energy converters or motor drives. Typical applications include converters for photovoltaics, battery storage or charging stations for electric vehicles. These new high-performance type filters are also the better choice for modern day frequency inverters used for motor control. The FMAC NEO filter series has screw terminals for safe and reliable wire terminations. 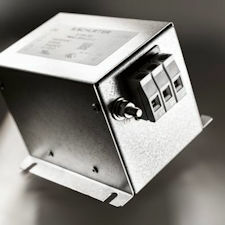 A full metal flange guarantees a good earth ground connection upon screw mounting to the chassis. The standard versions can be used over a wide temperature range from -40 °C to 100 °C. The filters are designed for currents from 16 A to 230 A at an ambient temperature of 50 °C. They are ENEC and cURus approved and recommended for applications up to 520 VAC. The standard versions are designed for industrial applications with leakage currents <13 mA. Special versions for leakage-critical applications of <3 mA are also available. The completely redesigned models of the FMAC NEO family are the ideal replacement for all types of Schurter legacy FMAC filters. The FMAC NEO offers the same high performance with significantly smaller dimensions and weight.